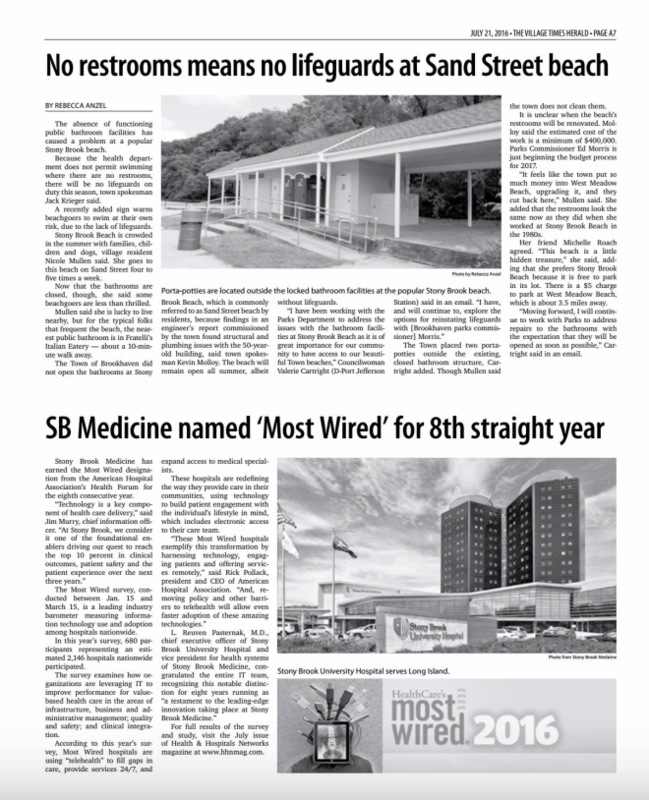 The Village Times Herald published this piece in print on July 21, 2016. The absence of functioning public bathroom facilities has caused a problem at a popular Stony Brook beach. Because the health department does not permit swimming where there are no restrooms, there will be no lifeguards on duty this season, town spokesman Jack Krieger said. A recently added sign warns beachgoers to swim at their own risk. Stony Brook Beach is crowded in the summer with families, children and dogs, village resident Nicole Mullen said. She goes to this beach on Sand Street four to five times a week. Now that the bathrooms are closed, though, she said some beachgoers are less than thrilled. Mullen said she is lucky to live nearby, but for the typical folks that frequent the beach, the nearest public bathroom is in Fratelli’s Italian Eatery — about a 10-minute walk away. 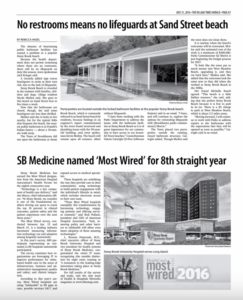 The Town of Brookhaven did not open the bathrooms at Stony Brook Beach, which is commonly referred to as Sand Street beach by residents, because findings in an engineer’s report commissioned by the town found structural and plumbing issues with the 50-year-old building, said town spokesman Kevin Molloy. The beach will remain open all summer, albeit without lifeguards. The Town placed two porta-potties outside the existing, closed bathroom structure, Cartright added. Mullen said the town does not clean them. It is unclear when the beach’s restrooms will be renovated. Molloy said the estimated cost of the work is a minimum of $400,000. Parks Commissioner Ed Morris is just beginning the budget process for 2017. “It feels like the town put so much money into West Meadow Beach, upgrading it, and they cut back here,” Mullen said. She added that the restrooms look the same now as they did when she worked at Stony Brook Beach in the 1980s. Her friend Michelle Roach agreed. “This beach is a little hidden treasure,” she said, adding that she prefers Stony Brook Beach because it is free to park in its lot. There is a $5 charge to park at West Meadow Beach, which is about 3.5 miles away. 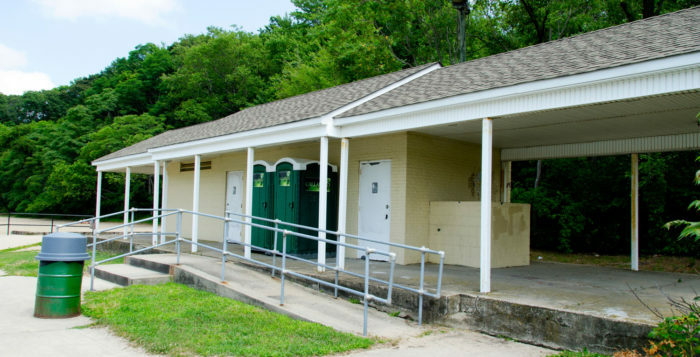 “Moving forward, I will continue to work with Parks to address repairs to the bathrooms with the expectation that they will be opened as soon as possible,” Cartright said in an email. Porta-potties are located outside the locked bathroom facilities at the popular Stony Brook beach. Photo by Rebecca Anzel.